For people with missing teeth, everyday interactions can be the source of embarrassment and discomfort. However, with today’s technological advances in dentistry, you can get a dental implant to replace your missing teeth. Dental implants are a great option because they look and act just like natural teeth. Here’s everything you need to know if you are considering getting a dental implant to replace missing teeth. A dental implant is an artificial root placed in your mouth via a surgical procedure. Dental implants consist of a titanium post, or cylinder that is permanently anchored into the upper or lower jaw bone. The artificial root of a dental implant will fuse with the bone in your jaw creating a long lasting and durable option to replace missing teeth. Implants can be used to hold a replacement tooth or to support other dental work such as crowns or certain types of bridges and dentures. Implants are quickly becoming one of the most popular dental services available. With continuous advancements in technology and materials, the procedure is now more affordable than ever. More people are opting for a dental implant as opposed to other options, such as bridges or even crowns, as a result of their durability and reliability. One of the most remarkable aspects of dental implants is their resemblance to natural teeth. The process of osseointegration creates a root, making an implant function as a natural tooth. After healing, there is no noticeable difference between an implant and other natural teeth. After the loss or extraction of a tooth, the surrounding bone in the jaw can begin to disintegrate. As the bone is reabsorbed back into the body, a host of oral issues may present. Dental implants perform the same functions like natural teeth and can keep the bone stimulated, so further bone loss doesn’t occur. Maintaining a dental implant is the same as maintaining your natural teeth. Unlike dentures, you don’t need to remove your implant to keep it clean. And, because it’s a long-lasting option, you won’t have to think about replacements, like you would with a bridge or crown. When you lose teeth, it can cause a change in the overall structure throughout your entire mouth. This shift can lead to alignment issues and can result in a weakened bite and potentially distorted facial features. A dental implant can help reinforce your bone and prevent any changes to your bite. When you lose a tooth, other teeth can deviate and try to take over the space. This shift can lead to potential gum health issues as well as problems with the stability of teeth. Unlike traditional bridges, dental implants don’t require surrounding teeth to be shaved down. Dental implants are ranked as one of the longest lasting fixes for tooth loss. They are permanent and specifically designed to handle daily wear and tear and can last a lifetime. In fact, studies have shown that it has a 95 percent success rate over 40 years of use. With the growing popularity of dental implants, the overall cost continues to decrease. For example, a bridge can cost anywhere from $3,000 to $4,000 and needs periodic replacement. Alternatively, a dental implant entails a one-time cost of around $4,000 to $6,000. The best way to determine whether or not you’re a good candidate for dental implant surgery is to schedule an appointment with your dentist. After you’re evaluated by a professional, they can better determine whether dental implants are beneficial to your specific situation. The patients who would benefit the most from dental implant surgery are those who are missing a significant number of teeth or those who require tooth extraction. Implants are often recommended in situations where bridges are not strong or large enough to replace your missing teeth. Before you’re cleared to get implants, you must first get a full oral health check-up from your primary dentist. You may be turned down for an implant if your jaw is in bad shape because an implant has to be connected to your jaw. You may also require prior or additional treatments if you have certain medical conditions, such as periodontal disease or diabetes. As with any dental procedure, the first step is to find an experienced dentist or oral surgeon to complete the surgery for you. Try to find one who is experienced in performing this operation. Ask your friends for recommendations, read reviews, and check credentials before you settle on a dentist. Now that you have chosen your dentist, you will go in for your first visit. The dentist must first make sure your jaw bone is strong enough to handle the implant. This is established through the use of x-rays, taking impressions of your teeth, and possibly a CT scan. This process is designed to gather as much information as possible about your jawbone, including information about the thickness, health, height, and density of your jawbone. Your dentist will then thoroughly examine the affected area and discuss all of your treatment options. During this appointment, your dentist may also take impressions for the crown portion of your implant. Next, you can set up an appointment for the surgery. Getting a dental implant is a relatively simple outpatient procedure. Here’s the process of what will happen on the day of your surgery. 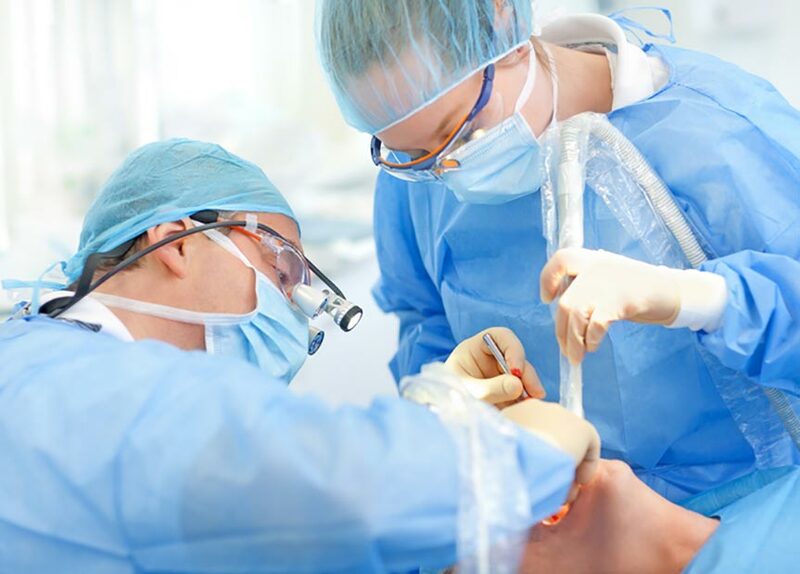 Anesthesia: The dentist will begin by injecting localized anesthesia to the affected area. You will be awake for the procedure, but you will not be able to feel anything other than slight pressure. If this method makes you anxious, you can ask to be completely knocked out or you can ask for a stronger anesthesia that will leave you awake, but unaware of what is going on. Prepare the implant site: Once the anesthesia has kicked in, the dentist will begin preparing the area in your mouth for the implant. They will start by making a small incision in your gums where the implant will be placed. Then, they will drill an osteotomy or a small hole in your bone. During the drilling process, your specialist will continually flush the area with water to prevent possible tissue damage. After the hole is drilled to the desired diameter, the dentist will use an alignment pin to ensure the implant is placed in the correct spot. Then, the implant site will be stitched up using self-absorbing stitches. Once the stitches have been applied, you are done with the first part of the procedure. You can go home and heal until the area is ready for the abutment setting. Healing time following this step can be anywhere from 3 to 6 months, to give the implant plenty of time to fuse to your bone. Setting the Abutment: The abutment is the small piece that serves as a connection between the implant and the replacement tooth, or crown. At this step of your procedure, you will be numbed with local anesthesia, and the gum will be cut to expose the implant. Once the abutment is placed, you will then be allowed to go home and heal. Placing the Crown: After around two weeks of healing, you will need to go back to the dentist’s office to finish the treatment. Once it has been determined that you have properly healed from the first and second procedure, they will once again open the gums at the implant site. Lastly, your dentist will screw the crown into the implant by hand or use a special drill. That’s it! The dentist will ensure that the tooth feels right before sending you home. After the procedure is complete, you will need to take certain steps to ensure there are no complications during the healing process. By following these measures, you can reduce the risk of infections, limit the amount of pain your feel, and make sure the implant stays in permanently. Brush your teeth twice daily and floss once a day. If food gets stuck in the area, use mouthwash. If your dentist suggests a special diet, do not stray from it. If they do not, eat only soft, healthy foods and do not intake too much sugar. To manage your pain, take ibuprofen or aspirin. Usually, patients only experience a dull pain for up to a week. Visit your dentist regularly every six months for checkups. This usually only happens if the entire procedure is completed during one visit. Without giving your implant time to heal between each step, too much pressure is applied to the implant during the crucial osseointegration phase. This could prevent full osseointegration and lead to a loose implant, or complete failure of your implant. Though this is exceedingly rare, some patients may have an allergic reaction to the titanium used in the stability post. If this is the case, the dentist will use an alternative material, like zirconia. If you think you may have a titanium allergy, it’s important to be tested before the dental implant surgery. Peri-implantitis is an infection in your dental implant. The infection leads to inflammation of the gums and bone around a dental implant, potentially leading to loss of the bone that supports your implant. An infection can happen if bacteria is introduced during the surgery, or if proper dental hygiene is neglected. This condition is more frequent among those who smoke, have diabetes, have a weak immune system, or those who have poor dental hygiene. If, after the procedure, you experience any issues at all with the implant, you should see a dentist as quickly as you can. The sooner you handle the issue, the sooner the problem can be rectified with limited discomfort. Dental implants are a safe, cost efficient, and durable treatment option for those who are missing teeth. Your confidence in your smile and your bite will be restored in no time at all. If you believe you may benefit from this treatment, schedule your consultation with our dentists at any of our 25 different locations. *Disclaimer: $2,999 price includes dental implant/surgery, abutment, and implant crown. Doesn’t include bone grafting, if required.